In recent weeks and months I received a number of innvitations to connect on LinkedIn, a business-social network. However, I can neither accept nor visit the profiles of all these persons. Access to the LinkedIn website from Russian based IPs has been blocked for six months or so by government agencies responsible, seemingly due to LinkedIn’s failure or non-willingness to comply with Russian law which requires internet companies to store data from users based in Russia on servers located in the Russian Federation. Dull behavior; first why not protect Russian user data by openign servers in Russia? Second, instead of informing users about this obstacle, LinkedIn continues to send me invitations, and advertisments via email – including links which I can’t access anyways. LinkedIn is simply loosing market shares and (my) trust. 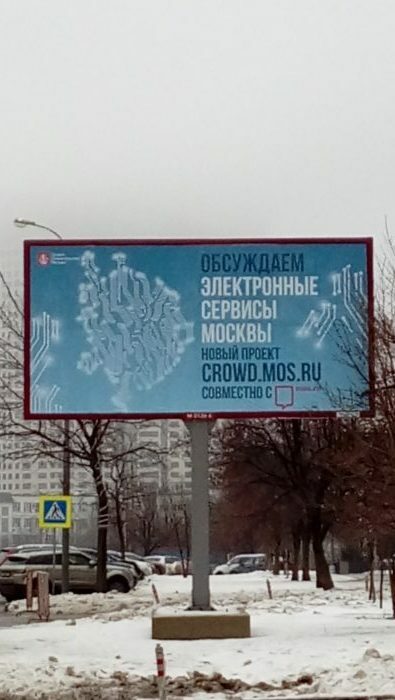 More promisising and pictured above: Moscow’s City government is implementing a new integrated e-government system, and informs citizens about it using ads like this one seen near Park Voronzovskiy Prydi.